« THERE’S A LOT OF INTERESTING PLACES TO SEE ON THE WAY TO JACUMBA. It looks like the Unarius founders, Ernest and Ruth Norman were right. There has been an intergalactic landing. Just kidding, it only looks that way. Scattered on a hillside on Old Highway 80 are cast concrete people. Many locals and travelers stop to take pictures of the unusual site. The owner of the property has a business that manufactures lawn features. Passing folks have provided the clothing and accessories. 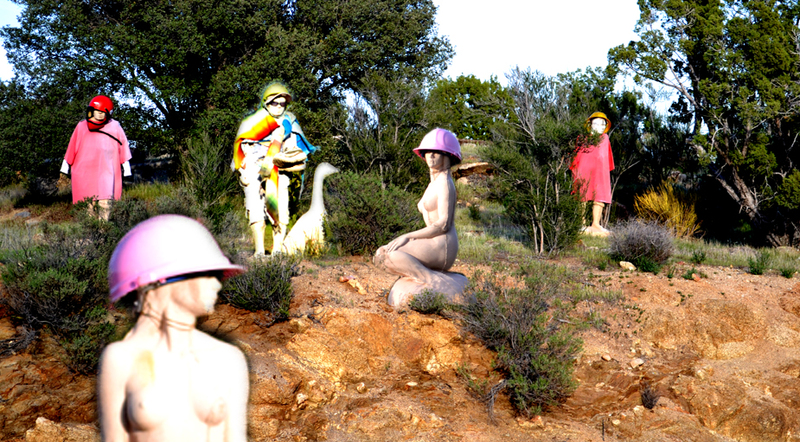 The figures stand as silent sentinels on a lonely hill, providing an eerie sight. My In-Ko-Pah story character, Rocky, was always amazed at the wild parties the concrete folks threw. Nothing worse than a mean drunk made from a cement mixer. It’s amazing how many things there are to see on the way to Jacumba. Some locals have said the concrete folks watch traffic pass with a slow turn of their heads. Hikers have heard crackling laughter, like the sound of breaking stone. No one hangs around after dark. The spook needle climbs into the red when night falls. They look mildly sinister during the day, but at night they are totally malevolent. 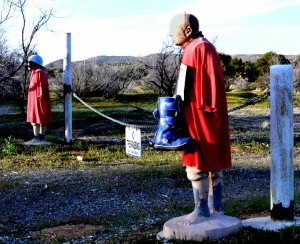 If you drive by on the way to Jacumba and stop, you might want to stay in your car. My name’s Wally Runnels, I write Border Pulp.